Late last week, DreamWorks Animation's Chairman of the Board of Directors, Roger Enrico, resigned. 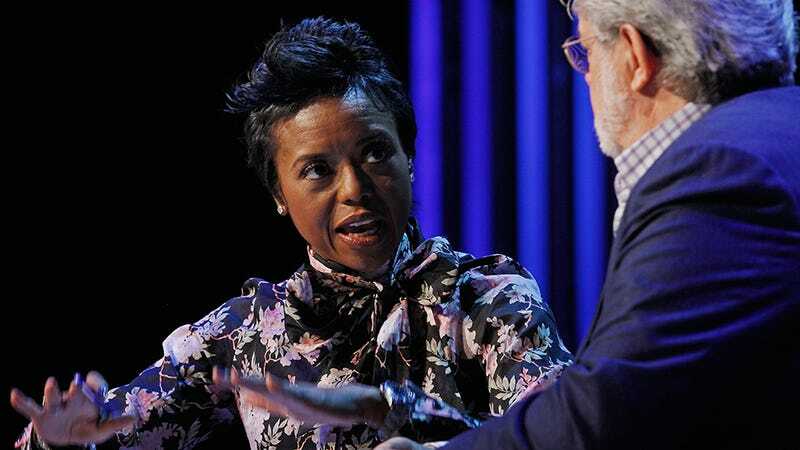 Now it's been announced that Mellody Hobson is the new Chairman of the Board for the company. Forty-three-year-old Hobson is the president of Ariel Investments, a firm based in Chicago that manages over $3 billion in assets. It's one of the largest African American-owned money management and mutual fund companies in the United States. Hobson is often seen on Good Morning America, discussing financial issues. Also! She happens to be dating George Lucas. DreamWorks Animation is responsible for franchises like Shrek, Kung Fu Panda and Madagascar; some of the projects in development include How to Train Your Dragon 2 and Captain Underpants. Hobson's status as a woman — and a woman of color — will impact the studio remains to be seen, but with her extensive take-charge business experience — she joined Ariel as an intern after finishing Princeton and became president about ten years later — will obviously be an asset.